Born just about 20 years ago as a disruptive technology for topology optimization of structures, OptiStruct has matured into Altair’s structural analysis and optimization solver solution for linear and non-linear structural problems under static and dynamic loadings. Altair’s Chief Marketing Officer, Jeff Brennan, introduced the OptiStruct technology to Altair and became the initial champion for the product. In an interview on the software, Brennan answers questions related to the history of OptiStruct, the importance of its technology, and what’s next for OptiStruct. Q: Tell a little bit about the origins and early development of OptiStruct. JB: In the early 1990s, I was studying topology optimization at the University of Michigan as part of my graduate work in biomedical engineering. Our laboratory was researching bone growth patterns and the theory that bone responds directly to external stimuli, often referred to as “Wolff’s Law”. We wanted to create a mathematical model to represent bone growth in the human body, which could then lead to treatment regimens to help induce bone growth to affect such conditions as osteoporosis. We found that the body does in fact try to find an optimal structure and microstructure in reaction to stress. 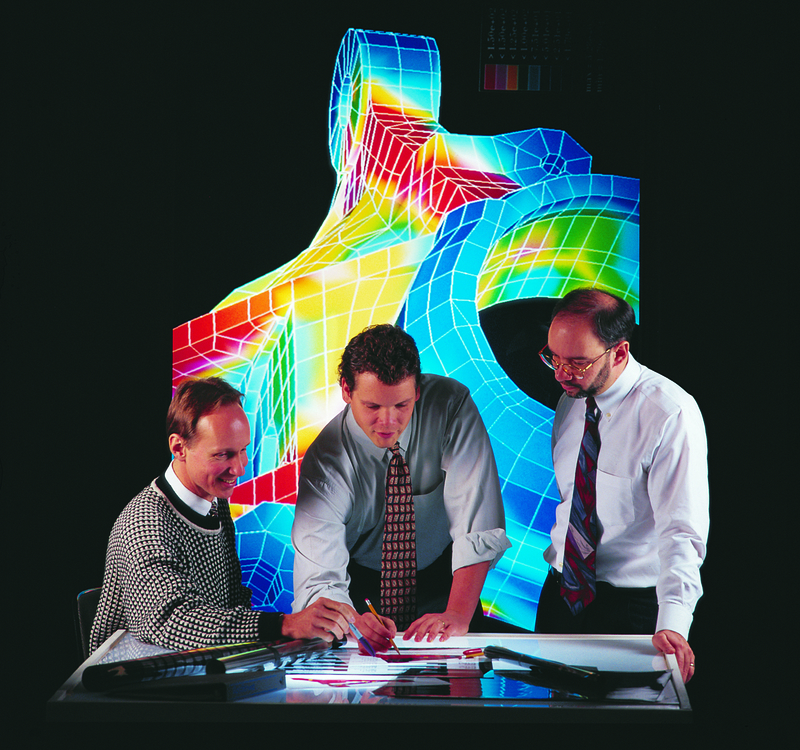 When I joined Altair in the spring of 1992, CTO Jim Brancheau and CEO James Scapa said they were interested in the research and wanted to pursue topology optimization as a commercial software. The software would take those mathematical principles and carry them into the commercial world to create optimal shapes in product design. Altair initially partnered with engineering professors at the University of Michigan to create the first commercially available version of a topology optimization algorithm. It took a little over a year to get the software ready and OptiStruct was officially launched in 1994. GM Powertrain became the first customer in 1994 and began using the software to create under hood brackets. Other applications and customers soon followed. After a few years, Altair took over the complete development of OptiStruct, adding software developers and investing heavily in the product. Several key people were integral to the success of OptiStruct and most of them are still actively involved in the development of the product. Q: How has OptiStruct matured since the early years? JB: It has taken a lot of development effort and trial-and-error in industrial application throughout OptiStruct’s 20-year history to make it truly successful. Initially I would travel around the globe to prospective customers with a portable workstation and solve topology optimization problems on site, in an effort to grow the customer base and fuel the investment in the product. New applications at customer and prospect sites continued to challenge OptiStruct’s existing capabilities and each year OptiStruct would add new features and solution types which would expand the scope of usage to a broader variety of problem types. The process was really interactive between the customer and Altair, as the software development team began to grow and features were often added “overnight” in response to challenges from the field – it was an exciting time. The software added a variety of solution types such as vibration and buckling analysis, additional element types, boundary conditions and response types. However, the solutions were often strange looking and challenged existing manufacturing processes as well as the conventional perception of an ideal design. Eventually we began adding ‘manufacturing constraint’ algorithms to guide the design toward a particular manufacturing method, such as casting or stamping, which was a significant breakthrough for OptiStruct. Soon we began adding other constraints like pattern repetition and symmetry controls, which further expanded the usage, and soon topology optimization became more widely accepted as a useful tool early in the design process. Additional variables in the design optimization problem statement were also added, such as the ability to change boundary shape and ‘topography’ (controlling the surface shape change in a controlled manner) of an existing design. Control of ‘sizing’ parameters, including thickness and parameters of a composite material greatly improved the footprint of OptiStruct in a more conventional design process, and the hard work started to pay off in broad acceptance and usage. In the last five to ten years, the software has really become an accepted form of design and people are now quite comfortable with this “disruptive” technology. Q: What capabilities enable OptiStruct to stand out against its competition and how does Altair’s experience with OptiStruct make a difference? JB: Including those mentioned above and many more, the breadth of OptiStruct’s solution capabilities is really unrivaled in the industry. Other software products do some of the same things, but OptiStruct had an early advantage and so much development has been put into OptiStruct that our head start has never been relinquished. OptiStruct also now has a full range of linear and nonlinear finite-element capabilities and is a truly world-class structural analysis solver. Lastly, the mature interfaces to OptiStruct available in HyperMesh and Inspire, help guide the user through the definition of optimization objectives, variables (including morphed shaped), and constraints. But Altair has also been using the software in our ProductDesign consulting division for 20 years now and that experience gives Altair an advantage, as we know better how to use which feature and solution type for varieties of problem types. Our engineering consultants and software developers really understand OptiStruct and work very well together to advance the software and test the latest developments in real-world applications. The concept of an “optimization center” has also increased the penetration of this technology throughout the industry, particularly in large organizations. It couples Altair’s two strengths: technology and domain expertise in an onsite model working directly with customers on their toughest problems. By allowing people from their own company to work with people who understand OptiStruct, they can work together to introduce a disruptive technology and make it work efficiently in the environment of the customer. Altair’s Optimization Centers provide a vehicle for knowledge and technology transfer and are a good teaching mechanism enabling faster and easier integration. In addition to OptiStruct’s software capabilities, Optimization Centers are a unique feature to Altair. Q: How has OptiStruct impacted industry in the last 20 years? JB: OptiStruct has really challenged people’s way of thinking about design. It effectively puts the ‘function’ in front of the ‘form’ in the ‘form/function’ equation. It was, and still is, “disruptive” in the sense that the technology may create strange looking shapes than can be unsettling or perceived as wrong. However, over time people have become much more comfortable with the “different look” and odd shapes produced by OptiStruct are now being tagged as “bionic” or “elegant”. These unusual structural forms prove time and again to be mathematically correct and extremely efficient. 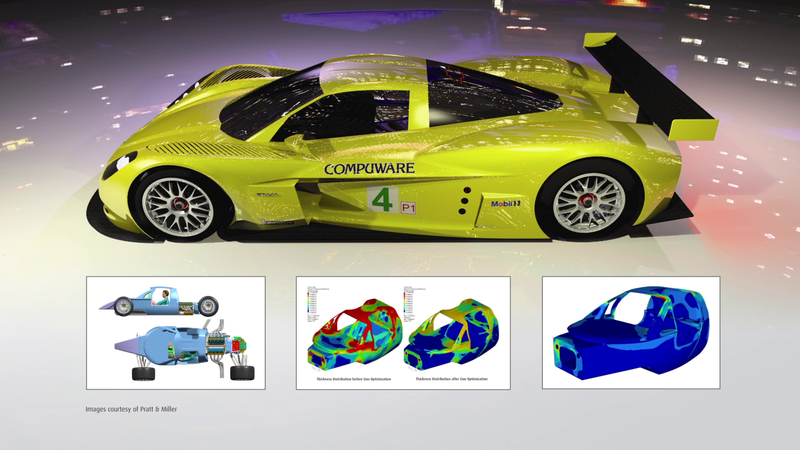 OptiStruct provides a different way of thinking about the design process – essentially performing simulation before the concept design and allowing this to lead the design process. This differs from most existing methodologies. OptiStruct’s solutions can be challenging to existing manufacturing processes and may require some additional effort or creativity to manufacture the ideal shape. However, these challenges often result in better manufacturing methods and processes that create more ideal solutions. Additionally, shortening the time to a feasible design often greatly improves the design process and allows for much more time to refine the designs. However, the biggest impact is clearly that the products created by OptiStruct are more efficient – they are lighter, stronger, and typically more sustainable. I strongly believe that OptiStruct is the most important tool in ‘green’ or sustainable design. Of the three “R’s” in sustainability, “reduce” is extremely important, even more so than “reuse” or “recycle”. By eliminating material from the design to begin with, it never needs to be mined, processed, or disposed of. By minimizing material, fuel consumption – regardless what the power source is – is notably reduced. OptiStruct has the ability to affect sustainability from the start and guides where the material should and shouldn’t be very early in the process. This potentially leads to significant material and energy savings if applied vigorously and throughout all industries. Q: What’s next for OptiStruct? JB: I believe we will continue to see rapid growth for OptiStruct as technology advancements converge with expanded market awareness. The technology is improving every year and the software is able to solve more and more problems. The market is also becoming more aware of the technology in general and the impact it can have on material reduction and sustainability. Topology optimization and 3D printing is an example of this convergence, which can combine for amazing material savings. OptiStruct shows great potential in transportation and minimizing the cost of travel, specifically in automotive and aerospace. Tougher fuel economy and emission standards are driving the renewed energy of lightweight design efforts for cars and planes. Lightweight design is the easiest way to minimize fuel consumption and CO2 emissions. By creating lighter structures, there is less energy is required to propel the vehicles which often leads to smaller engines and less required supporting structure. This essentially creates a virtuous cycle of lightweighting. Finally, although OptiStruct has been available for 20 years, people are still discovering it as a “new technology”, which keeps the people at Altair and the product energized. Altair will continue to invest in more solution types and more multi-physics approaches in optimization, and more connections to advance manufacturing methods and advanced materials. It is an exciting time to be where Altair and OptiStruct are now – at the convergence of manufacturing advancements, lightweight design motivation, and a general acceptance of this methodology. We really are in the right time, with the right people, and creating the right software. Since joining Altair in 1992 as an engineering consultant, Jeff has served a variety of technical and business roles, including program manager for Altair’s optimization products, director of sales and marketing, and vice president of the HyperWorks® business unit from 2001-2009. He was responsible for the creation of OptiStruct® software at Altair and managed the product during its early years. Jeff's technical background includes specialties in biomechanics and optimization.He received his engineering education from the University of Notre Dame, Northwestern University, and the University of Michigan.